Several years ago (2009), I wrote a book about one of my passions – website marketing. I built my own practice website back in 1999. I’ve been at it ever since, and I’ve learned a few things about what makes websites work. I let the book go out of print with the plans of writing a 2nd edition with updated and revised information. And, then I procrastinated… and procrastinated. But, a lot of people persistently hounded me to get it done. As much as the internet changes, a lot of what makes websites work remains the same. The basic principles are relatively constant. The details change. Google doesn’t really “change.” Rather, it REFINES how it works constantly, so it works BETTER. I went through my book, section-by-section. I revised most sections to be current. But, I found the main messages remained true, despite all the “changes.” In the end, the old book was 200 pages, and the 2nd Edition is 230 pages. This time around, I decided to make it an “eBook” that is downloadable. Dentists like immediate gratification! It also reduced the cost of the book substantially. Printing the full color illustrations on glossy paper with tabbed chapters in a 3-ring binder was expensive. Shipping the heavy book was expensive, too. Shipping it overseas was even more expensive and fraught with calls and emails about missing books. Now, it’s instantly available, worldwide, with the click of a mouse. If you would like to learn more about what’s in my book (and see a whole bunch of testimonials), you can visit my website at: Rev Up My Marketing. 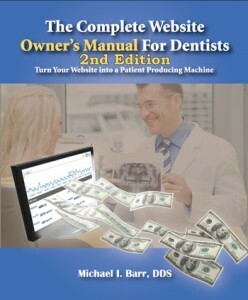 Click here if you’d like to download a free preview of the Website Owner’s Manual. If you want the full copy in your hands right away, you can just click the button below. The original paper version of the manual sold for $347. The regular price for the downloadable 2nd Edition is $197. For a limited time, you can save an additional $50 by using the coupon code, “dental warrior” (without the quotes) in the check-out screen! That’s $147! Remember, this is an instantly downloadable product. No waiting!